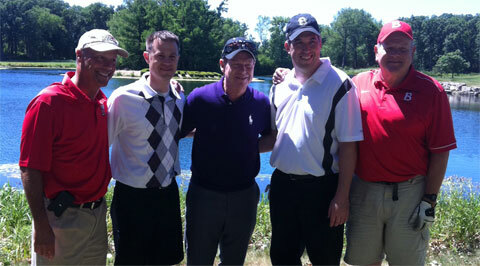 PFP Sports & Celebrity Talent Agency recently secured golfing great Tom Watson for a fundraising event in Chicago, Illinois. Tom began the day by taking photos and answering questions from the VIP’s & sponsors. After lunch, he traveled the course taking photos with the participants and concluded the appearance with dinner and a speech, talking about his career and the 2009 British Open where, at nearly 60 years of age and 26 years after his last major championship victory, he lost in a four-hole playoff to Stewart Cink. The event was a huge success with more than 200 golfers. It’s not every day that people have an opportunity to meet a true legend and one of the all-time greats – Tom’s presence created lots of excitement and greatly added to the event. Tom’s humble nature and friendly personality left a lasting impression on everyone. Tom is considered one of the greatest golfers of all-time. He won 39 times on the PGA Tour, including five British Opens, two Masters and one US Open. He was named PGA Player of the Year six times and was the leading money winner five times. On the over-50 Champions Tour, Tom has won 13 times, including five senior majors. Several of Watson’s major victories came at the expense of Jack Nicklaus, most notably the 1977 Open Championship and the 1982 U.S. Open. Though his rivalry with Nicklaus was intense, their friendly competitiveness served to increase golf’s popularity during the time. Throughout his career, Tom has been one of the most respected players on tour. He received the US Golf Association’s prestigious Bob Jones Award for distinguished sportsmanship in 1987 and was elected to the PGA World Golf Hall of Fame the following year. In addition, Tom won Golfer of the Decade for the 1980’s, which honored his 19 wins and 86 top-10 finishes over the decade. Tom is also well respected for his charitable work. For 25 years, he hosted in his hometown of Kansas City the Children’s Mercy Golf Tournament, a benefit event featuring the likes of Nicklaus, Arnold Palmer and Lee Trevino. Over the 25 years, the tournament raised over $25 million for a local children’s hospital. After Tom’s long-time caddie, Bruce Edwards, died from ALS in 2004, Tom helped start the Bruce Edwards Foundation for ALS Research and the next year began the Bruce Edwards Celebrity Classic with author John Feinstein, raising nearly $3 million over the first five years of the tournament. Tom has also become involved with supporting our troops and visited Iraq both in 2007 & 2009, where he celebrated Thanksgiving, gave golf lessons and donated golf equipment. He’s also raised funds for Wounded Warriors. PFP Sports and Celebrity Talent Agency is a speakers bureau and top booking agent for celebrities, sports speakers, golf speakers, athlete appearances and endorsements. For Tom Watson speaker and booking agent information, call 1.800.966.1380.